Parliament voted on Sunday to sack Nawfal al-Akoub as a consequence of last week's accident in the River Tigris that killed almost 100 people. On Wednesday, Nineveh's investigations court said he and several other officials were suspected of misusing their powers and wasting public money. The head of Mosul's Civil Defence Authority said the ferry was loaded to five times its capacity and most of the dead were women and children who could not swim. Mr Akoub visited the scene of the tragedy on Friday to commiserate with the victims' relatives. But when people gathered there saw his car, they shouted "thief, thief, thief", a video of the incident showed. Mr Akoub gestured to his chauffeur to drive off, which prompted people to start throwing rocks at the car. The vehicle hit several people while attempting to leave, injuring at least one of the victims' relatives. Two days later, the governor and his two deputies were sacked by parliament at the request of Prime Minister Adel Abdul Mahdi. In a letter to MPs, he accused Mr Akoub of negligence and dereliction of duty, and said there was evidence he was misusing funds and abusing his power. 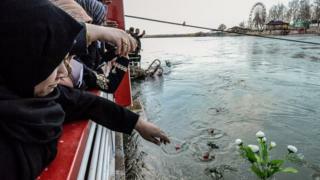 At a weekly media briefing on Tuesday, Mr Abdul Mahdi blamed the ferry sinking on "greed and negligence" and said he would work to implement health and safety regulations, according to the Kurdish news agency Rudaw. "What would it have cost the investors if he had given each individual on the ferry a lifejacket? We would have saved most of the victims," he was quoted as saying. "We will strike powerfully with the fist of justice, and we won't allow for such things to be repeated," he added. Mosul is slowly recovering from the war against the jihadist group, Islamic State, which seized the city in 2014 and was driven out three years later after a fierce battle that left large areas in ruins and killed thousands of civilians.